Breast pain affects up to 70% of women on average. Breast pain is a common symptom among women, normally occurring during times when hormones are in flux - like menstruation, pregnancy and menopause. Breast pain refers to any feelings of discomfort, tenderness, and soreness in one or both breasts. There are two types of breast pain: cyclical and non-cyclical. Cyclical breast pain is recurrent and linked to a woman's hormones and menstrual cycle. Non-cyclical breast pain includes things like cysts and medicinal side effects. 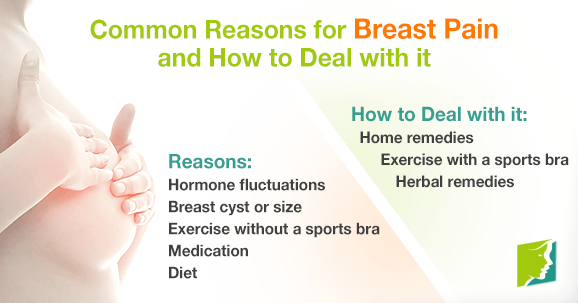 Keep reading to learn about the common reasons for breast pain and how to deal with it. Hormonal changes - especially of estrogen - are the leading cause of breast pain, causing irritation of the breast tissue, resulting in pain. Premenopausal women are more susceptible to cyclical breast pain because of the periodic fluctuations experienced every month with their menstrual cycle. Breast pain can be caused by a cyst in the breast, which are fluid-filled sacs that develop in the breasts, and are usually benign. That being said, it is still recommended to see a doctor to be sure that the cyst is harmless. Breast size can also affect women. Larger breasted women are more prone to breast pain than women with smaller breasts. Unfortunately, exercise can cause breast pain. A recent study published by The British Journal of Sports Medicine examined the correlation between breast pain and exercise in active women. The results showed that exercise can influence breast pain. Researchers say poorly-fitted sports bras are a main cause of breast pain, so it is crucial to get a properly fitted bra before working out. Breast pain is a common side effect of certain medications like oral contraceptives, anti-depressants, and cholesterol and heart medication. It is important to be aware of the side-effects of your medication before taking them. Foods that are high in salt and saturated fats can trigger breast pain. As well, alcohol and caffeine are also breast pain triggers. Cold compresses or heating pads can help reduce breast pain. Other helpful home remedies for breast pain include taking a warm bath with soothing essential oils, like rosemary or lavender, and wearing loose organic cotton clothes. Although it seems counterintuitive to exercise, it has been shown to be beneficial in the long run. Studies have shown that exercising regularly can significantly increase energy, improve mood, and significantly reduce stress. Walking, biking, and swimming are all excellent low-impact workouts that can help ease breast pain. Just be sure to wear a properly fitted sports bra before working out. Herbal remedies are a natural and economical method to treating breast pain. Two popular herbs for treating breast pain are evening primrose oil and soy. These herbs are anti-inflammatory, and can help reduce pain. Breast pain is a frustrating, and sometimes debilitating symptom that affects around two-thirds of women on average. The leading cause of breast pain is hormone fluctuations. It is important to know that breast pain is rarely a sign of breast cancer, but it is crucial to get regular breast exams and be breast aware. Helpful at home remedies for breast pain include cold compresses and herbal remedies. Read more about breast pain treatments. Does Birth Control Lead to Breast Tenderness or Pain? Read about the relationship between breast tenderness and birth control here so you can know the best measures to take concerning your reproductive health. Women experience breast pain for many reasons, and breast pain often appears or increases as women approach menopause. Click here to read more. Q&A: Why Do I Have Breast Pain? Experiencing breast pain? Read on and discover the answers to your questions about breast pain.